Summary: The internet is changing us and society so fast – how we work + communicate + interact + shop + research – that it is not enough anymore to just observe and only partly dive in. “Internet” is not about going or being online any more, it is as relevant to our daily live as much as having warm water. I place “being connected” on my personal Maslow’s pyramid. It is nothing you should be looking at separately any more and still, many still do. The new motto should be: “Get playful, get experimental – or stay behind.” and applies especially to companies and organisations. The major realization which struck me was that it is important to just do it. Start the website although one does not know everything about itÂ yet. Because the Internet is developing so fast, you can try to plan, but will never know if it is outdated by the time you are ready to implement. And that sentence just nails some thoughts floating around in my head for some time.Â You need to experiment, you need to play around just to be able to get to know the things fast enough to start to make an informed decicsion. Not on a personal level, and especially not on a corporate level facing the customer. There is no time any more to first have R&D to figure some stuff out, or have somebody do some dossiers about if one should dare the experiment,Â then get it approved, then move it on etc – everybody has to constantly work on those skills to be ready when you want to do something. And it is not limited any more to “let the other department do it” or “that is not my job”. If you are starting to think about Twitter just now, you are already too late. That should have been on your map at least a year ago. #2: Buhu, my names are gone! If your names are gone, stop complaining. You are a professionell entity and as such “securing accounts” should have been on your list at least 18 months ago and reference the one you use for domains with brands, names and products. There is no blueprint how to do it. We are all experimenting and making it up as we go. #4: Twitter can only be part of you social media strategy. “But you do at least have an online strategy, don’t you? #5:Â Your employees HAVE to be trained by you and have to be guided. They are not stupid or anything but it is your job to make sure they can keep up to date. And that means much more than just one conference a year for upper management. 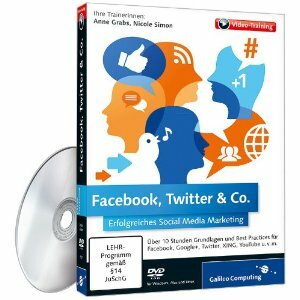 #6: That business modell “Internet” or “Twitter” – not. There is no money to be earned in Twitter. Nor on the Internet. There is only money to be made with business modells and implimentations of these strategies using tools like Twitter. So basically nothing new. I leave them with the “good news” that per se this is not really something new, it is just some new technologies behind it. But their core job and skills stays the same. Something else I throw in is the Cluetrain Manifesto (web site / book). 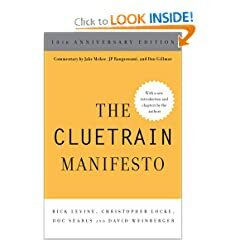 It has been 10 years now that the cluetrain manifesto is out and still most companies are not even at the part of “we do have an online strategy”. So, how does one do it? You talk to people who know a bit or two about this, work with their experience and use their judgement to see where something fits for your company, where you may have to look into because customers expect it and which are the areas you can ignore for now. External advice and mentoring can only be part of the equation or it will cost you a lot of money. And by talking I do not mean just one session or so, but you need to have your resident expert on this, similar to the person doing your taxes or your layer. Parts of this belongs into your own hand, part of it you can outsource although it should be done on your side, but other parts you need to rely on the skill and training of the expert. One way to find them is because they show up all the time with these new technologies. Which for one is the reason I have been in a lot of interviews for print, radio and tv over the years, first for podcasting, then second life, now twitter. It is not because I am good at faking to be a so called expert, it is just that I have played around with this stuff a lot longer than others and when somebody like me has put this into my regular toolkit, others start using it. Meaning I do have a head start plus by experience I do know how to use and implement those tools. Look for these people and make a mental note if a name does show up regulary so you can test them if they are a fit for you and your organisation. Usually people like myself have preferences of people and kinds of organisations / corporations we like to deal with. Top management needs to give the okay for people to play around while making sure that people don’t create chaos. It is their responsibility to put up the strategies, free the budgets and use their brain to realize what this is about. Though in many companies it is still some employees who make their innocent first steps and need to be careful not to be caught. Similar to computer training (which happened in some parts) training in Social Media and co is now relevant for most of the customer facing side of the companies. Different to just browsing the internet the evolution speed is now so fast that companies cannot rely on the individual to learn how to twitter, use facebook, blog etc etc. For one Twitter seems to be a great tool for people to get their feet wet for the first time in what we call Web 2.0 or Social Media or whatever. It is simple enough yet covers all the bases (sharing, communicating, collaboration etc), but is easy enough to handle (140 characters top and you even can do it from your mobile). It also seems to be a great way to instead of starting to think about a big Social Media Strategy to start with a “what would we need to do / talk about / set into motion if we just wanted to start on twitter?” Going on from there, some other things fall into place and become clear. It may be in such a way. But sometimes I’m wondering about the “waste” of time, of conciousness; and — Web2.0 is much more dependent on external ressources as be stated in the past. You have to be “in”, but also “out”, you must have good media competence or you can get manipulated very easy. And, last thing, the social or “age” divide in the use of the internet, best seen nowadays in Germany. Internet is like zen buddhism, the future is unclear, the past is not important. Power of now! Ich stimme absolut zu. 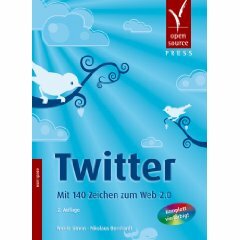 Allerdings erinnert mich das an Luhmanns Systemtheorie: Die beiden Systeme “Web 2.0” und “Business” haben (noch) zu verschiedene WÃ¤hrungen, Merkmale und Codes. Sie verstehen einander (noch) nicht. Das mÃ¼ssen Ãœbersetzer/Berater machen – schwer genug. Only being available online doesn’t mean to be important. Being not available online makes unimportant. So step into the new world. But be patient and not spamy. I think thereÂ´s not to many people around that understand the power of the Internet.